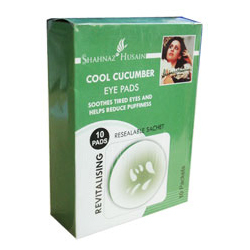 Buy Shahnaz Cool Cucumber Eye Pads - Soothes Tired Eyes & Reduce Puffiness, Dark Circles, Relieve Stress & Induce Relaxation. Cooling & Refreshing Eyes. Free Worldwide Shipping. Shahnaz Husian - Cool Cucumber Eye Pads - Soothes Tired Eyes and Helps Reduce Dark Eye Circles. Containing cooling and refreshing natural extracts of Cucumber, Chamomile, Aloe Vera, Ginseng and Green Tea, these soothing pre-moistened eye pads help to relieve stress and induce relaxation. They also reduce dark circles and puffiness around eyes. Apply for 10-15 minutes to feel their wonderful rejuvenating benefits.